All the patterns here were created by me, using Adobe Illustrator and saved as PDF files. To view and print, you will need a copy of Adobe Reader, then print on 8 1/2″ x 11″ letter-sized paper. I’ve tried the patterns and I like my dolly clothes to fit snugly. If you like loose fit, you will have to adjust the patterns accordingly. Any feedback/suggestion is always welcome; just comment below to leave me a note. Have fun! [Please Note] If you have enjoyed my patterns, please consider supporting my site by donating any amount you see fit. I don’t mind if you use my patterns to make items for sale as long as I am credited – it takes a lot of time and effort to make my own patterns and to make them free to everyone in the doll community. Thank you! I love to knit and I think everyone should too! 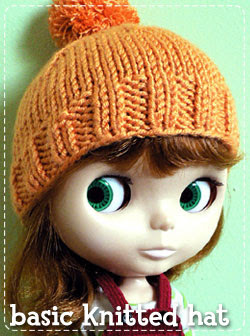 I created this basic knitted hat for Blythe using DK-weight yarn that’s quick and easy for an advanced-beginner. You will need to know basics such as cast on, bind off, the knit stitch, the purl stitch, simple decrease (k2tog), some experience with DPNs, and make a pom-pom. The end result is a super-cute knitted hat! I love retro style clothing for my girls, and vintage Skipper doll’s “All Spruced Up” dress is one of my favorites. After losing a few auctions on eBay, I decided to try to make my own, and this is the result! Use a patterned fabric for the bodice/sleeves and a solid color for the collar/cuffs for a classy look. Attaching the cuffs could be a bit tricky, so you might want to make a practice one first. Press before attaching the pieces. This top was inspired by the vintage Skipper dress set “Ship Ahoy.” With or without stripes, a simple, versatile top is a must-have in every Blythe wardrobe. The pattern itself is straight-forward and is fast and easy to put together. If you are using a cotton t-shirt material, I suggest hand-sewing around the neckhole and sleeve seams. The skirt was also inspired by vintage Skipper, from the dress set “Dog Show.” It may take more than one try to put it together, but it is a very cute skirt that can be mixed and matched with many pieces. I used pink corduroy and it was very easy to sew together. You can also try using different colors for the inside panels or different material such as wool or tweed to complete a winter wardrobe. 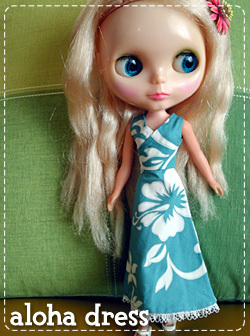 The aloha dress came from an idea to redesign the original “Aloha Sprit” dress set from Takara. I decided to make my version of “Aloha Spirit” a versatile and flattering A-line dress that will look great even if you don’t use a Hawaiian-print fabric. What a nice site you made. My daughter and I are new in the world of Blythe. She just got her first doll and she is called Lizzy. And now it’s up to mom to create clothes. Wich mom thinks is a “terrible” job. I never played with Barbie’s when I was young only creating clothes from pieces of fabric. So mom is back in years and has fun with her daughter. Thanks so much Corine for your kind words, much appreciated! Lizzy is very lucky to have handmade clothes! So glad to hear both you and your daughter are having fun together. Thanks so much for these great patterns. Can’t wait to get started sewing. The woolly hat is my go to hat pattern! Thank you for posting the patterns! 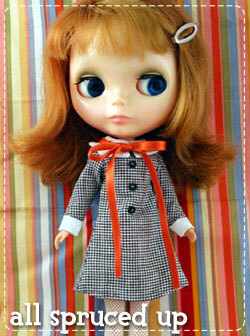 I just bought my first Blythe. Thanks to you she will have something to wear! Thanks so much. I have a Pullip Doll. She fits in most Barbie clothes. Hi Vikki, I don’t know where you are seeing this YouTube. I’m not German nor do I speak German. I am in the US. 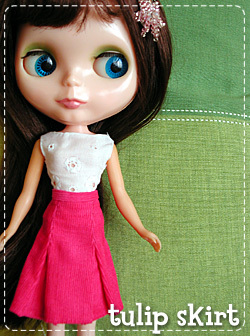 I no longer collect Blythe but I keep the site up for the Blythe community. Thank you so much for your beautiful patterns!! Thanks a million for such kindness. I wish I can do these. Thank you for the comment and Paypal, Majo! I don’t speak Dutch but tried to translate – are you able to print the patterns at all? Let me know! I’ve downloaded several of your patterns and they are very enticing – I am very eager to make some of them – I am new to Blythe. I am so happy you still have these patterns available.